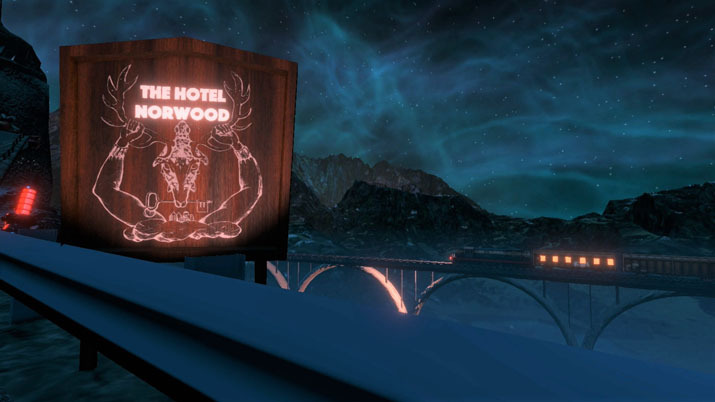 Come and vacation at The Norwood Suite, where everyone is looking for something. Upon arrival, you are welcomed by our lovely front desk clerks and greeted by several Mount Rushmore-like heads that blast music through speakers in their mouth. Our facilities provide a relaxing getaway for many patrons. Upon downloading, installing, and playing The Norwood Suite you immediately notice something. You will probably notice many things going through this adventure, but the main point of focus is the faint feeling of ‘something is a little different here.’ You may feel like someone is watching you at all times, or that you are starting to slip into insanity. That's all normal with Cosmo D's The Norwood Suite. Cosmo D has a unique and intriguing style of design, and for those who have played their first game, Off -Peak, you are no stranger to the strangeness of the world you are in. Whether it is the music of the world around you or the character design, something is, well, different. And it’s amazing. You adventure around the hotel with the goal of gaining access to a nightclub at the bottom of the hotel. To do so, you assist the other patrons of the hotel, helping them find whatever they are looking for. The mechanics of the game are simple enough: you walk, you look, you interact with objects by picking them up and placing them down. But, where this title stands apart from anything in the same genre is the story that is eerie and a little vague, keeping you exploring and wanting to piece together everything that is going on. The hotel you'll be running around feels lively with people, objects and movement, yet in a stasis. With very few on-screen movements from the patrons, they manage to make the hotel feel like a full experience, and not just you alone in their massive facilities. The art style sets the tone of the title, with everything feeling more like a fever dream than a videogame. The world by no means reflects anything in the real world, which is immersive in the same way that you want to go back to bed after waking up from a good dream. Aside from the art being different, the background music sets a strange tone as well. This entire story is based off of music, following some musicians, and your end goal is to give a DJ a CD. So, naturally music plays a large role. As you 'talk' to the patrons in attempts to help them out, only music comes out of their mouths (don't worry, there are subtitles), and oftentimes this music fits in quite well with the music going on in the background. After running around, getting lost, picking up items, getting lost again, and finally reaching the end, you are left a little unsettled. Without spoiling anything, paying attention to details is a large component to this game, if you are looking to maximize your full experience of The Norwood Suite. But even after a thorough playthrough, confusion may still be something on your mind, which may be frustrating to some, and with its short play time you may feel a little high and dry. 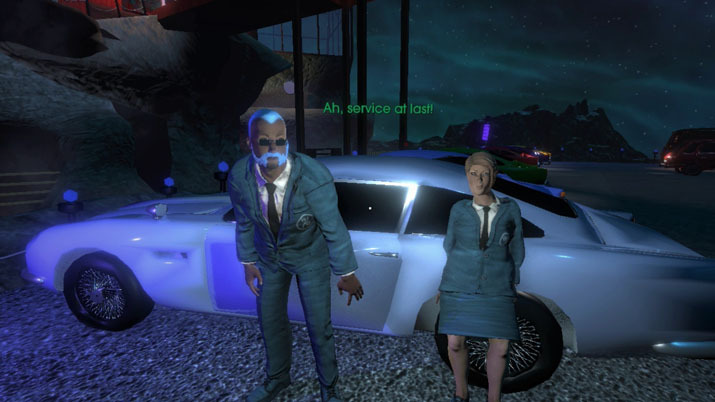 The experience of The Norwood Suite is incredibly unique, each design choice, be it of the musical or visual arts, very much reflects Cosmo D's style. They seek their own aesthetic, telling their own story with their own art, rather than aiming to be another cookie-cutter game. The world in which you play feels well developed and full, but not cluttered, keeping you on the path of the game, but not on rails. The Norwood Suite — along with their first release, Off-Peak — are two games worth the effort and confusion.